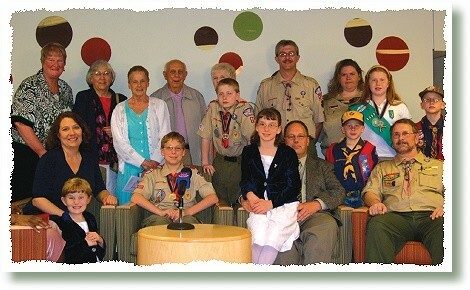 On, May 9, Golden Year 6 (2009), the Illinois Center News Team drove to Holland, Michigan to present the Shining World Honesty Award to 11-year-old John Robert (J.R.) Bouterse. In April of last year, J.R. found a lost wallet containing $800 while playing in a church parking lot. His immediate reaction was to take the wallet to the police. The money belonged to a 20-year-old lady who had just cashed two weeks’ salary and placed it in her wallet. The police department wanted to give J.R. a monetary reward for his honorable action, but instead, he asked for a pizza party for his entire Scout troop. A surprise guest at the party was the woman to whom the wallet was returned. She was very grateful to John. During an interview for Supreme Master Television, J.R. said that he did not feel like a hero for what he did, and everyone should do the same. When asked if he had a “to be or not to be” moment, he replied that he just wanted the wallet to be returned to the owner, because he knew how it felt to lose money. Not long ago, John also lost a wallet which contained his savings. Miraculously, shortly after he turned in the wallet he found, his own wallet was also returned to him! At the Boy Scout Council’s Award banquet, John very humbly accepted the Shining World Honesty Award, a framed letter from Master and other gifts, not just for himself but also for all the scout members; on both his own and their behalf, he sincerely expressed his appreciation to Supreme Master Ching Hai for this honor. J.R.’s family was also present at the banquet. They were proud that their son had done the right thing, because his action has touched the hearts of so many people. From all the amazing e-mails, calls and letters received from all over the country and overseas, Mrs. Bouterse realized that people actually want to hear that something good is happening in the world as it gives them a sense of hope. Indeed, John’s act of honesty has made our world a kinder, happier and more hopeful place to live, because as Master said in the Award letter, “one good deed leads to another,” and more people will surely be inspired to follow the noble example of this young boy.